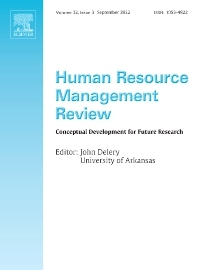 The Human Resource Management Review (HRMR) is a quarterly academic journal devoted to the publication of scholarly conceptual/theoretical articles pertaining to human resource management and allied fields (e.g. industrial/organizational psychology, human capital, labor relations, organizational behavior). HRMR welcomes manuscripts that focus on micro-, macro-, or multi-level phenomena relating to the function and processes of human resource management. HRMR publishes articles that provide new insights aimed at stimulating future theory development and empirical research. Critical examinations of existing concepts, theories models, and frameworks are also welcome as are quantitative meta-analytical reviews that make a conceptual/theoretical contribution. Subject areas appropriate for HRMR include (but are not limited to) Strategic Human Resource Management, International Human Resource Management, the nature and role of the human resource function in organizations, any specific Human Resource function or activity (e.g., Job Analysis, Job Design, Workforce Planning, Recruitment, Selection and Placement, Performance and Talent Management, Reward Systems, Training, Development, Careers, Safety and Health, Diversity, Fairness, Discrimination, Employment Law, Employee Relations, Labor Relations, Workforce Metrics, HR Analytics, HRM and Technology, Social issues and HRM, Separation and Retention), topics that influence or are influenced by human resource management activities (e.g., Climate, Culture, Change, Leadership and Power, Groups and Teams, Employee Attitudes and Behavior, Individual, team, and/or Organizational Performance), and HRM Research Methods. Papers introducing or helping to advance our understanding of emergent HR topics or issues are also strongly encouraged. HRMR does not consider manuscripts that report qualitative or quantitative studies that test hypotheses or inductively examine ideas. In addition, conceptual papers and meta-analyses that do not sufficiently advance the literature in terms of providing novel insights for further theoretical development and empirical research will not be considered. Moreover, in its quest to foster the development of general theories and models, HRMR does not consider papers that deal with a single occupation, company, industry or country, nor cases of these entities (a single company, industry, etc. can be used as the primary example, but should not be the only example and the insights of the paper must be generalizable beyond that primary example). Finally, as a scholarly journal, manuscripts written primarily for practicing managers are also not considered. Submissions of these types of papers will be rejected as being outside the scope of the journal, unless requested as part of a special issue. The Editor and Associate Editors will provide an initial editorial review to determine whether submissions fall within the scope of the journal and/or are of sufficient merit to warrant peer review.